Drawing templates are patterns that serve as a guide to follow. You might notice that I refer to them throughout my site as outlines but that is not entirely correct. As a matter of fact, drawing outlines are like a profile or the border of an object with no detail, as in the first wine glass here. They look very boring and are sometimes unrecognizable as to what they represent. On the other hand, it is contour lines that form the individual shape of an object whilst including basic details. However, they only show form and they do not indicate texture or color. On almost all of the images I've included on my site, there is a small amount of detail to show how to progress with the illustration. So, I guess I should be calling my 'outlines' by their proper name which is 'contour lines' but I am not one for formalities! In my mind, drawing templates are basically outlines that include a bit of detail. To make sure I am covering all the bases, I have added the outlines here plus corresponding contour line drawings so that both of these together form a template to suit you. A butterfly drawing template is very popular for beginner artists and crafters alike. Most of us love to draw butterflies because they are considered a symbol for so many different things. We each have our own beliefs on what they represent. These 2 individual illustations are not exactly the same shape even though I used the butterfly outline as a guide to create the next example. Sometimes I make up the pattern on the wings and sometimes I use reference pictures for general guidance. When you design the wing pattern, the resulting image becomes completely unique to you. I draw and erase several times, until I achieve the look that I want so don't be averse to doing the same. A butterfly shape is easy to memorize so it's great for doodling and stumbling onto new ideas. You will notice when you copy that the results are not an exact replica of your reference picture. Don't get frustrated by that, providing your copy resembles the subject, simply carry on. Besides, it's a good thing that your creation is different because you're adding a little piece of you. Have a look at the difference between my examples and you'll notice that no two are exactly alike even though I was copying from the outline. The subtle changes should not worry you, the main objective is to achieve a good likeness. 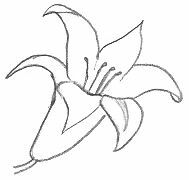 This flower drawing template was selected for its ultra-simple lines. A lot of flower varieties are easy to convert into templates. Once you have been drawing for a while you will be able to recognize what you are capable of and what represents a challenge -- that is part of the fun of being a hobby artist. 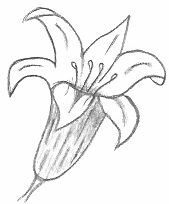 There are some beautiful reference pictures and photos of all types of flowers. I usually browse through gardening books and magazines for inspiration and ideas. Nature is the best topic for trainee artists because we are free to make little mistakes. Nothing has a definite shape in Nature. Animals are a little more challenging so I set out to establish the outline of a rabbit first. Once my light sketch (or foundation) looks good, I can complete the drawing. Bunnies are a popular subject because they are such a cute looking animal. From my own experience, the rabbit outline was the most difficult out of all the images on this page. That should not deter you from trying to copy it though, it is good to test your skills to measure how much you are capable of achieving. In this example, notice how the application of some quick strokes has transformed the basic template. At this stage, I'm happy with my progress but I need to relax my grip on the pencil and lose the rigid appearance of my illustrations. It's only a matter of time. Clearly, I am no expert artist but I did teach myself to draw by copying every single thing that appealed to me. Trial and error pretty much sums up my early beginnings. I created all of these drawing templates in my third year as a hobby artist. This is an easy outline of a bird which makes great practice for beginner artists. Only a few strokes are required to turn it into a simple bird illustration. Do a little test by grabbing a pencil and make a quick copy of the bird outline and see what happens when you add a couple of details here and there, as in the next example. This test constitutes practice and it does not matter if you are not happy with your results, the fact is you will improve the next time you try it. 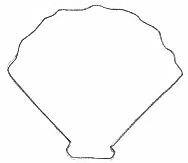 Use this outline of a shell for practicing. Observation is important so all beginners need to make a concerted effort to study a subject prior to making a mark on paper. These are the types of exercises you need to do as steady practice. I am reluctant to harp but it is by copying simple outlines that ultimately helps you to progress because your observation skills are being strengthened. I hope you learn a lot from these drawing templates because that is how I started and what I credit for giving me the confidence to continue. It is only a matter of practicing until you are satisfied with the results. Then you progress onto doing yet another outline of the same subject, in preparation to create a full sketch complete with a few extra details. You will produce a very decent drawing, I have every faith in you! In hindsight, I should have practiced with these contour lines several times and I would've ended up with better drawing templates to show you. In most cases, these outlines were done on the first attempt. Please, don't keep reading about how to draw, you have to get out your paper and pencils and start right now to really enjoy this adventure.